“When I picked up the steel guitar everyone was expecting country, but I wanted to be in outer space,” says Thomas Beall, the multi-instrumentalist who performs as Gingerwolf. 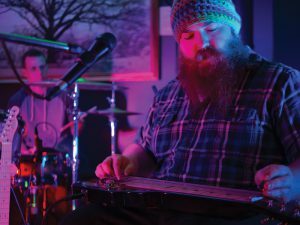 Beall’s music is sometimes described as “Hawaiian space jazz,” due to its ethereal quality and his use of one of Hawaii’s most iconic instruments, the steel guitar. Beall’s unique sound has landed him on the stages of several renowned venues in the region, including the District of Columbia’s 9:30 Club, Black Cat, and most recently, the Kennedy Center. He’s also a sought-after session musician, recording with Swampcandy, Skribe, and Jimi Davies’ Mend the Hollow, among others. 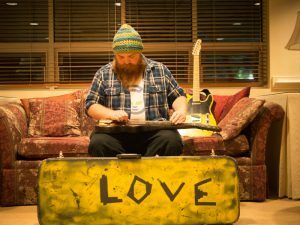 “I remember hearing him play his lap steel and just being blown away with how lush and beautiful his songs were,” says Davies, who asked Beall on-the-spot to play on his album. Beall’s songs are sometimes described as soundscapes, an apt description of his dreamy, instrumental compositions. After writing lyric-based music for several years, he found that instrumentals allowed him to write with a greater degree of expressiveness and nuance. “Words don’t adequately say everything that you think,” he says. He gives his song “Red Bracelets” as an example. 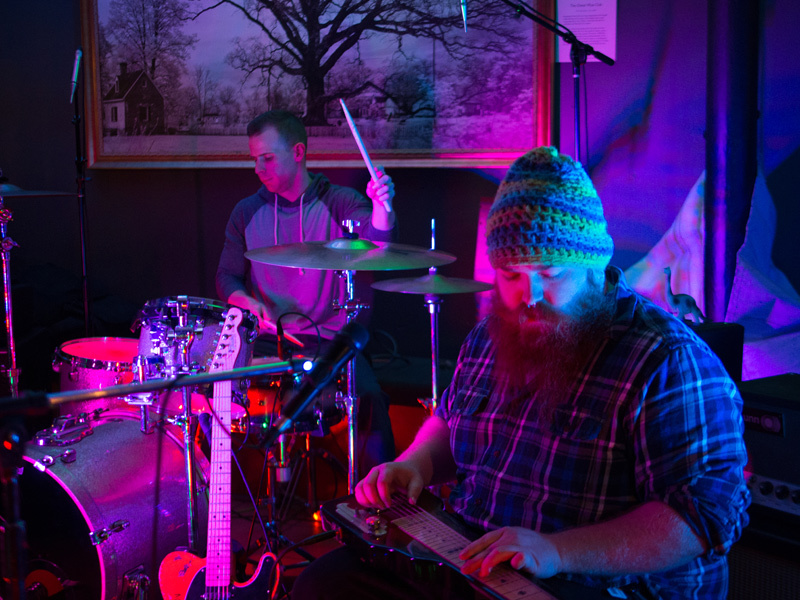 Written about a friend’s struggle with anxiety and anorexia, the song’s dynamic changes, from a driving but subdued melody to an intense storm of feeling at its end, reflects the ups and downs Beall saw his friend go through. “She’d be really closed off, and then every once in a while you would get a glimpse of the chaos inside,” he explains. A native of Arnold, Beall demonstrated natural musical ability from an early age, picking up the drums, bass, and guitar, and other instruments. By high school he’d become a regular in the local music scene, attending concerts in Annapolis and Severna Park. He also began writing songs using a bass guitar and an old cassette recorder. He performed before an audience for the first time when musician friend Charles Kavoossi asked him to be his opening act at 49 West Coffeehouse, Winebar & Gallery. Beall was thrilled. “I had to skip class to learn enough songs to play. I’m sure I wasn’t very good,” he smiles. Over time, Beall kept writing and performing became easier. He decided to pursue music full-time during his senior year at University of Maryland, Baltimore. 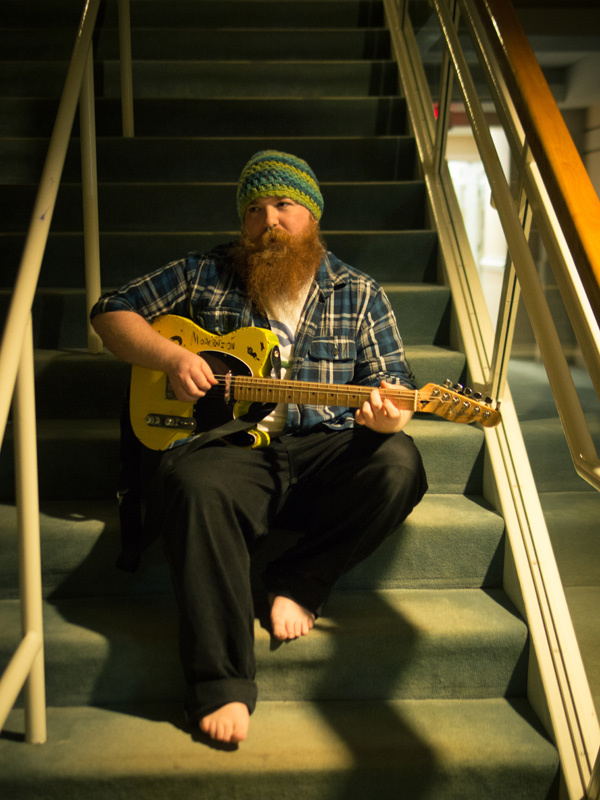 Working toward an International Relations degree by day and squeezing in band practice and gigs by night, the offer of a music publishing deal pushed him to choose between the two paths. He chose music. And while the publishing deal ultimately fell through, he has never second-guessed his decision. “It got me to finally follow my heart and create,” he says. Since then, Beall has pursued his dream with passion, drive, and an admirable do-it-yourself spirit. He set up his first tour by sending out more than a thousand email inquiries and stringing together 20 dates from the responses he received. Although some of the venues were less than stellar, he used the opportunity to hone his craft and connect with music fans one room at a time. “It has grown very naturally, in a kind of grassroots way,” he says. Today, Beall does four to five short tours each year, mostly on the East Coast. On each outing, the audiences grow. “On my last tour, I played to crowds of people I didn’t know, who were there to see me,” he says. “That’s what you’re doing it for, really.” While on the road, Beall acts as an ambassador of the Annapolis music community, handing out compilation CDs to people he meets along the way. “I think my friends are making some of the coolest art out there right now, and I want the world to see it,” he says. Error: Error validating access token: Session has expired on Saturday, 09-Mar-19 15:57:50 PST. The current time is Tuesday, 23-Apr-19 09:45:58 PDT.